So far, Toyota’s TRD Off-Road package was reserved for body-on-frame models only. Starting from today, however, the rule is no longer valid as the Japanese automaker used the impressive guise for its compact crossover. 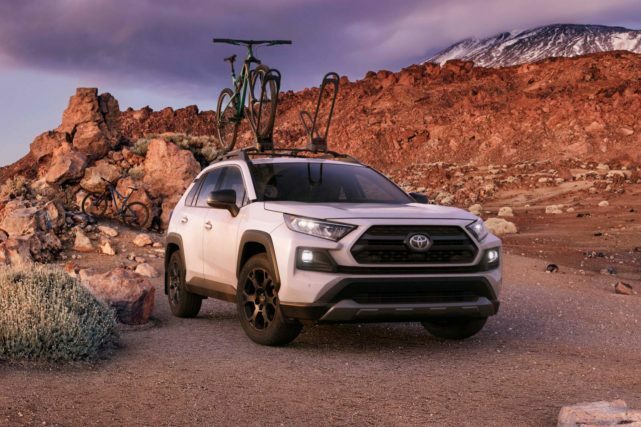 Take a look at the 2020 Toyota RAV4 TRD Off-Road – the cool looking high-riding vehicle that surprised us all at the 2019 Chicago Auto Show. Even though the RAV4 TRD essentially is just the crossover, it delivers a respectable amount of off-road abilities. Basically, the model has been built upon the RAV4 Adventure, but it offers a lot more than the interesting trim level thanks to its 8.6 inches of ground clearance and TRD extras such as an off-road suspension with revised twin-tube shocks and new springs, Dynamic Torque Vectoring all-wheel drive, and lightweight TRD 18-inch matte black aluminum wheels which have been wrapped with Falken Wildpeak A/T Trail all-terrain tires. It’s important to mention that the Dynamic Torque Vectoring can direct up to 50 percent of engine torque to the rear axle only. It’s good to know, however, that the feature can channel torque to the right or left rear wheel, depending on the situation. The small SUV has been fitted with TRD-based exterior and interior kit as well. From the outside, the 2020 Toyota RAV4 TRD Off-Road shows a specific and oversized grille, aggressive bumpers, TRD unique high roof rails, and LED-treated fog lamps. The crossover gets a two-tone treatment from the outside featuring Magnetic Gray Metallic with Ice Edge Roof combo. Though, potential buyers can opt for Midnight Black or Lunar Rock also paired with Edge Roof, as well as Ruby Flare Pearl and Super White. 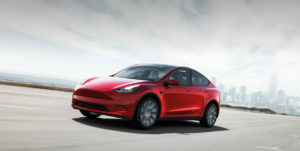 Inside, the driver will really enjoy thanks to red trim accents, SofTex seat surfaces, red stitching, and all-weather floor mats. 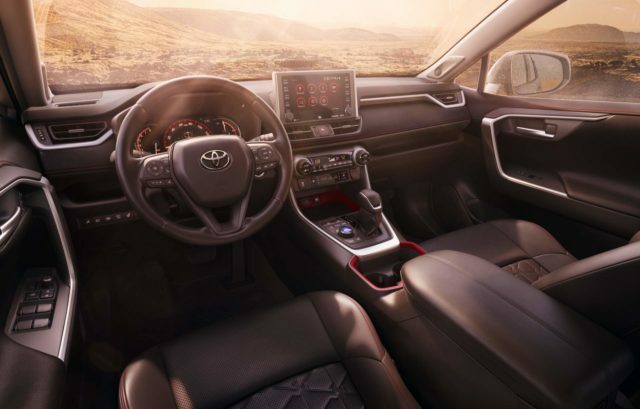 The 2020 RAV4 TRD Off-Road also comes fitted with automatic emergency braking, hill start assist control (HAC), trailer sway control (TSC), and downhill assists control (DAC), as well as with Multi-Information Display (MID). 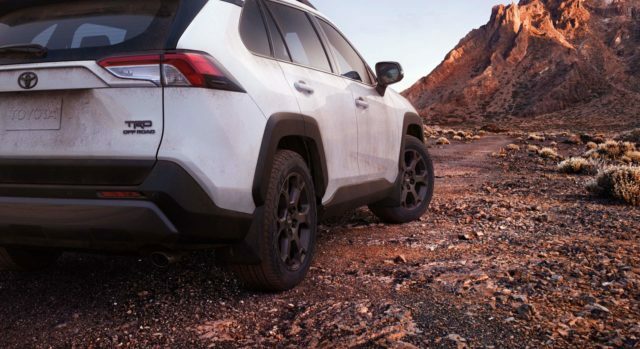 The 2020 Toyota RAV4 TRD Off-Road comes coupled with a 2.5-liter four-cylinder engine. The mill squeezes off 203 horsepower that travel to wheels via an eight-speed Direct-Shift automatic transmission. The off-road crossover offers a Multi-Terrain Select system. 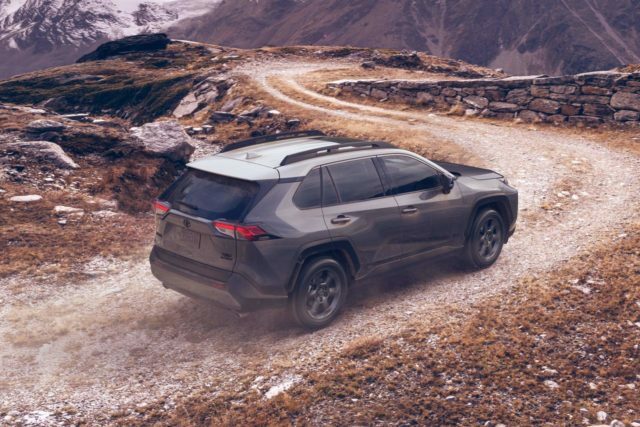 The feature enables selection of three modes: Mud & Sand, Rock & Dirt, and Snow, as well as the towing ability of 3,500 pounds, which is, you have to agree, more than enough for the small crossover. Regarding the AWD, the system isn’t necessary active during normal driving, thanks to Rear Driveline Disconnect that optimizes fuel economy. 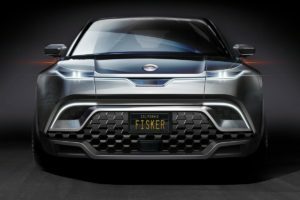 The Japanese automaker hasn’t released any pricing information so far. However, according to well-informed sources, the 2020 Toyota RAV4 TRD Off-Road should start selling at $34,000.